QVC’s parent, Liberty Interactive Corp., did a big deal Wednesday. And it smells like a good one. Liberty and FTD Cos. struck an agreement for the floral company to buy Liberty’s Provide Commerce floral and gifting businesses. Under the terms of the $430 million transaction, Liberty will receive 10.2 million shares of FTD common stock representing 35 percent of the combined company and $121 million in cash. FTD and Liberty expect to complete the transaction by the end of the year. How does this affect QVC? Liberty plans to create two different tracking stocks, namely QVC Group as the umbrella for the home shopping network,Liberty’s stake in HSN; and Liberty Digital Commerce to represent e-commerce businesses such as Provide Commerce. That stock split will now be delayed. “Liberty Interactive still plans to create the QVC Group tracking stock, which will be comprised of its interests in QVC and HSN,” the company said in a press release. Here is part of Liberty’s statement on its FTD deal. The strategic combination of FTD’s brand and floral network with the Provide Commerce collection of established and highly recognizable consumer gifting e-commerce brands, which include ProFlowers, Shari’s Berries and Personal Creations, will further FTD’s vision to become the world’s leading and most trusted floral and gifting company. The transaction will unite two highly complementary businesses, generate material cost synergies and create a team with “best-in-class” operating strategies. Together, FTD and Provide Commerce, each with over $600 million in annual revenues, will offer consumers innovative and expansive floral and gift products and an enhanced shopping experience. The combined company will also allow FTD to provide greater support for the overall floral industry by expanding resources to create new programs and services to support member florists in their local businesses. “This transaction provides the opportunity to create significant value for our stockholders and offers immediate benefits for consumers and our premier network of member florists. The combination of these businesses will expand the breadth of our brands, provide opportunities to further diversify our revenue streams and open up additional avenues for growth and innovation,” said Robert S. Apatoff, President and Chief Executive Officer of FTD. Deepens Consumer Gifting Category: The combination of Provide Commerce’s collection of respected and highly recognizable e-commerce brands, including ProFlowers, Shari’s Berries and Personal Creations, with FTD’s iconic brands, FTD and Interflora, and Mercury Man logo is expected to enhance FTD’s already robust consumer floral and gifting category. Strengthens Floral Network: The expected efficiencies and greater resources of this combination will enable FTD to further invest in new products, services and technology that are expected to directly benefit its vast network of florists and the floral industry as a whole. Enhances Consumer Shopping Experience: FTD will immediately be able to offer a wider selection of floral and gifting products, providing consumers with greater convenience and choice. Provides Significant Cost Synergies: The combination is expected to generate more than $25 million in annual synergies within 36 months of closing, with a goal of creating incremental value for FTD stockholders over time. Yikes! Basketball legend Shaquille O’Neal has joined the HSN family, set to appear on-air for Monster Products Thursday. He will present two products at 8 a.m. and 5 p.m. The Monster Superstar Speaker, at $129.95, is the world’s smallest audiophile Bluetooth speaker. This pocket-sized speaker features big sound, is lightweight and can fit into your pocket, briefcase, or backpack. The speaker has a built-in microphone for crystal clear speaker phone conversations, and pairs with Bluetooth 4.0. “This splash resistant speaker is really the party that fits in your pocket,” HSN said in a press release Wednesday. The Monster Powercard, at 39.95, is a credit-card sized smartphone charger. It is super slim and can fit in your wallet. The Powercard has a universal USB port to charge anything from an iPhone to a Samsung Galaxy. We posted a blog awhile ago when HSN mother of invention Joy Mangano introduced her line of pillows. We got a lot of comments from customers who bought them, and hated them. And a lot of people may be about to be disappointed. Mangano broke a record on HSN this weekend when she brought back her Comfort and Joy MemoryCloud pillows and sold nearly half a million of them, or over 216,000 sets, the network said Monday. That performance shattered HSN’s previous record, also set by Mangano, for the most units of a single item sold in a single day on the home shopping network. Mangano beat her own prior record of 174,000 units sold in one day of her Forever Fragrant Odor Eliminating, which she set in 2010. At the gym, when we’re on the elliptical machine, we often watch Bravo at night. Just last week we were watching “Housewives of New Jersey” and saw Gorga wearing a striking gold collar-type necklace. Well, it is from her HSN jewelry line, the “Grecian Goddess” collar, for $30, item number 354-423. We were unimpressed with NeNe’s cold-shoulder top. A red-hot jewelry brand is coming to QVC Saturday for its super sale at the Hamptons, which will benefit ovarian cancer research. It’s Alex and Ani, the American designers of those ubiquitous expandable metal bracelets that young women are piling on their wrists. We actually have four of the bangles, three in brushed gold and one in silver. We got our first one from our friend Diane as a birthday gift more than a year ago, before the bracelets with their dangling charges showed up everywhere and on everyone. Some may say the trend has peaked, but we still like the bangles, so lightweight that you forget you’re wearing them. You can find a large selection at Nordstom, and TJ Maxx has also had them at times at a nice discount. For its Saturday sale, QVC is promising to offer merchandise at 50 percent its MSP, so we’re waiting to see what the Alex and Ani bracelets sell for. They normally retail at $30 to $40. Interesting enough, QVC is also hawking its own knock-off of the Alex and Ani bracelets. The home shopping network calls its version “The Extraordinary Life Expandable Charm Bangle,” item No. J296024. Unlike the Alex and Ani originals, which are made of base metal, QVC’s version is sterling silver. And even made of that precious metal, it’s on advance order for $40, just $10 more than the base metal originals. As with the Alex and Ani bracelets, you have a choice of QVC bracelets with different charms that have inspirational messages. QVC and the Ovarian Cancer Research Fund (OCRF) are joining forces once again for “QVC Presents Super Saturday LIVE,” an annual “designer charity sale” scheduled to be broadcast live from the Hamptons this Saturday. During the two-hour shopping gala, premier fashion, beauty, jewelry and more will be offered for half the manufacturer’s suggested retail price with 80 percent of the purchase price of donated merchandise benefiting OCRF’s research programs. These proceeds will also benefit Woman to Woman, OCRF’s nationwide patient program designed to support women currently undergoing treatment for gynecologic cancers. The live broadcast will feature a variety of designer deals from top brands including philosophy, Alex and Ani, JAI by John Hardy, Amrita Singh, Honora, orYANYand many others. The “QVC Presents Super Saturday LIVE” broadcast will offer a behind-the-scenes look at the soiree with celebrity interviews straight from the red carpet. To help promote QVC’s efforts, Kelly Ripa, a longtime supporter of OCRF’s Super Saturday and co-star of “LIVE with Kelly and Michael,” is featured in both the print and television public service announcements for “QVC Presents Super Saturday LIVE.” Ripa will also lend her voice once again as the host of the charitable event. Adding a new twist to the power of social media, toGather, QVC’s discovery shopping experience, and Lisa Robertson, QVC host of the “QVC Presents Super Saturday LIVE” broadcast, will launch a new Super Saturday collection featuring this year’s designer goods. Shoppers will be encouraged to “Heart for Hope” by hearting and sharing items and social stickers to help spread awareness for ovarian cancer research. HSN Inc. will release its second-quarter results on Aug. 7 at 8 a.m. before the market opens, the home shopping network said Thursday. CEO Mindy Grossman and Chief Operating Officer and Chief Financial Officer Judy Schmeling will hold a conference call at 9 a.m. to review the results. A replay of the conference call can be accessed until Aug. 21 by dialing 855-859-2056 or 404-537-3406, plus the pass code 72340808, and will also be hosted on the company’s website for a limited time. HSN CEO Mindy Grossman had a chance to become the head of J.C. Penney Co., but couldn’t come to terms with the troubled brick-and-mortar retailer, The Wall Street Journal reported Monday. As for Grossman, The Journal was very flattering to her. It said that Grossman, a former Nike executive, was “seen as a rising star.” In 2012, Grossman was approached by Avon Products about becoming its CEO, The Journal reported. The financial paper also said that Grossman “is credited with crafting a more upscale image for the Home Shopping Network.” It’s HSN, dummies! Hip-hop star Nicki Minaj, on her best behavior and without the rainbow hair and booty-shaking, is on HSN right now, touting her new perfume. Host Colleen Lopez is fawning all over her, but we guess that’s her job. ST. PETERSBURG, Fla., July 10, 2014 /PRNewswire/ — Fashion and beauty vanguard, global entertainer and multi-platinum recording artist Nicki Minaj has partnered with leading entertainment and lifestyle retailer HSN to launch her latest fragrance, MINAJESTY Nicki Minaj Exotic Edition tonight! The superstar will unveil her new Eau de Parfum exclusively on HSN during her first-ever live appearance July 11 at 12:01 A.M. (EDT). Also during the debut, Minaj will give an exclusive sneak-peek of Onika Nicki Minaj, the next endeavor in her fragrance collection, making this live appearance an absolute must-see event. Drawing upon her glamorous evolution, MINAJESTY Nicki Minaj Exotic Edition is the next doll to reign in Minaj’s fragrance empire, bringing new excitement to the MINAJESTY Nicki Minaj brand. MINAJESTY Nicki Minaj Exotic Edition inspires Minaj’s fans to bring out their outrageous side, and have fun with life – especially by taking risks, trying new things, and traveling outside their comfort zone. An upbeat celebration for life and spontaneity, this brand inspires Minaj’s fans to feel exotic, flirtatious and glamorous. EXOTIC represents the outrageous experience of trying something new, FLIRTATIOUS represents a girl’s bright and breezy readiness to flirt when she knows she’s cute and stylish, and GLAMOROUS is the positive and fearless commitment to oneself. An exotic fruity floral musk that reigns with mouthwatering fruits and a luscious floralcy, glimmering in the sensuous warmth of sheer musk. The fragrance opens with the bright, sparkling nectar of Bergamot, Orange Squeeze and Mango for a luscious, mouthwatering sensation. The heart blossoms with Tiger Lilies, as Lavender Blossom and Dewy Petals wrap the senses in a floral oasis. The sensuous drydown glows with the exotic warmth of Creamy Musk and Cedar Wood. Minaj’s transformation into a spontaneous, blonde bombshell takes center stage in the MINAJESTY Nicki Minaj Exotic Edition design. Donning a blonde, wavy wig and a playful, black bustier, the newest “doll” in Minaj’s fragrance portfolio is vibrant, magnetic and full-on glam. Onika Nicki Minaj Eau de Parfum Rollerball .34 fl. oz. Well butter our buns and call us a biscuit: Smashbox Cosmetics has defected from QVC to HSN! Well, let’s put it this way: Smashbox will now be selling its wares on HSN. Whether that was the cosmetics maker’s decision, or QVC didn’t renew its deal with it, is unknown. But HSN trumpeted the company’s debut on its airwaves Wednesday. Smashbox will premiere today, Thursday, at 7 p.m., and again throughout the day on July 14 and 15. “Smashbox Cosmetics is a leader within the makeup industry and I am thrilled to welcome them to our growing portfolio of top-tier beauty brands,” Anne Martin-Vachon, HSN’s chief merchandising officer, said in a canned statement. Smashbox will give HSN shoppers a two-day exclusive preview of its new Photo Finish Pore Minimizing Primer and Be Legendary Longwear Lip Lacquer on July 14 as part of HSN’s month-long 37th birthday celebration. “Admired HSN”? Is that a dig at QVC? HSN will offer an assortment of products at launch, featuring Smashbox favorites, exclusive configurations and exciting new additions to the line. Our buddy Bill Brand, an HSN honcho, got a big promotion Tuesday. Hope Mindy is giving you a big raise, friend. Brand, 48, was named president of the home shopping channel HSN, effective immediately. Brand will also keep his post as chief marketing officer of HSN Inc., the parent of the TV network and the Cornerstone unit. 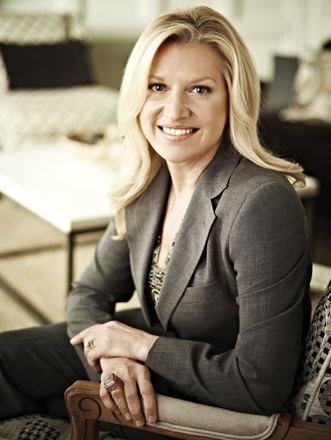 Brand, who is also an executive officer of the company, will continue to report directly to HSNi CEO Mindy Grossman. “Eight years ago, Bill was the first person I hired to join the HSN team and has been one of my key partners in transforming HSN into the full network of experiences that it is today,” Grossman said in a canned statement. Brand, a veteran of Lifetime Television and VH1, created an integration strategy at HSN that “has resulted in unique partnerships with major film studios, the production of world-class events, the launch of global brands and innovative content across all our platforms,” the network said in a press release. “Recent partnerships such as Univision, AOL, Disney and Toyota as well as new marketing and CRM capabilities have all contributed to HSN’s highest customer file growth, now exceeding 5 million active customers,” the statement said. In his new role as president, Brand will look to forge new strategies for the growth of HSN as well as continue to position HSNi as a leader in the retail industry. He will assume responsibility of merchandising, programming, planning and HSN2 in addition to his current responsibilities. “HSN is uniquely positioned to transform the retail industry by creating new ways for consumers to experience and interact with their favorite brands through content and commerce across all platforms,” Brand said. Brand joined HSN in 2006 as senior vice president of Programming. He has continually taken on increased areas of responsibility, adding marketing and new business development followed by TV operations, creative and digital. In 2013, Brand was promoted to chief marketing and business development officer of HSNi. Prior to joining HSN, Brand spent more than 10 years holding senior executive positions in programming with Lifetime and VH1, contributing to rapid growth and development of both entertainment networks. He spent the first decade of his career in news management at regional television stations nationwide and has received numerous awards for his work in journalism. You are currently browsing the Homeshoppingista's Blog By Linda Moss blog archives for July, 2014.